Convertible or sedan? Downtown or suburbs? Electric or manual toothbrush? As life decisions go, it’s certainly not choosing your next car, or deciding where you want to live. But, even when you are selecting a toothbrush, it helps to make a list of the pros and cons of the contenders before you make that final selection. The most important factor in choosing a toothbrush is finding out which model works best to eliminate bacteria and plaque. And studies have shown that, used properly, both electric and manual toothbrushes do a great job of removing plaque. Some electric models can reach the backs of teeth and the gumline more easily, some manual head designs work better for your individual mouth and teeth, so your particular needs should dictate which style of toothbrush you use. Talk to us about the best methods to brush with your preferred toothbrush, and we’ll let you know if one type of toothbrush or the other might work better for you. Brushing too energetically can actually harm teeth and gums, causing sensitivity and damage to the enamel and gum tissue. 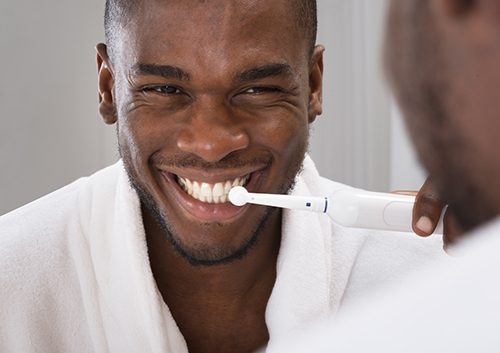 An electric toothbrush should provide a continuous brushing motion without needing any pressure from the brusher. This might be the model for you if you have a too-vigorous approach to brushing, or sensitive teeth and gums. An electric toothbrush can also be more efficient for older and younger brushers, those with limited mobility, and those with health conditions or injuries that make brushing with a regular toothbrush more difficult. An electric toothbrush is not a one-time investment. You should change the removable head as often as you change your manual toothbrush (every three to four months, please). But this cost is offset if an electric toothbrush is more efficient in removing your plaque, easier to use, or even if you just prefer it to manual brushing. If you find that you brush better and more often with an electric toothbrush, the added expense is well worth it. Whichever brush you decide on, the most important part of the brush is the person holding it! A regular appointment with your toothbrush for two minutes of thorough brushing in the morning and two in the evening, daily flossing, and regular visits to our office for checkups and cleanings will keep your teeth healthy and strong no matter which toothbrush you choose. Questions about your toothbrush choices? Don’t hesitate to ask Dr. Frech at our Wichita Falls, TX office.